Hope you all had a great long weekend! It’s very difficult to get back to work after a long weekend 😣. How many of you feel the same? Today am going to review one more hair cleanser from the popular brand The Nature’s Co. I have already reviewed their Sandalwood body wash, Cool Cucumber body lotion and their BeautyWish Subscription box. Till now, The Nature’s Co products haven’t disappointed me. But I have used only their Bath and Body range, not skincare or haircare. 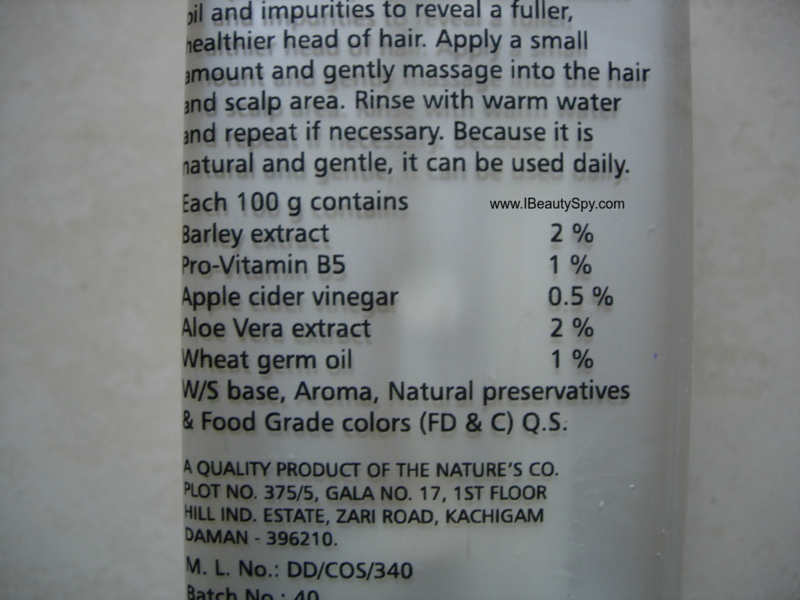 The Nature’s Co Barley Volumising Hair Cleanser is my first haircare product from them. And I am totally disappointed with it. Read on to know why. 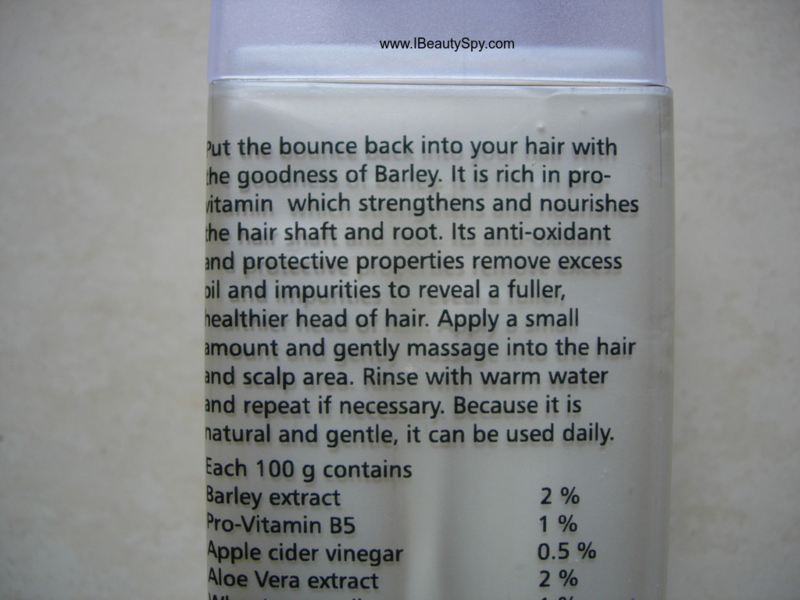 Put the bounce back into your hair with the goodness of Barley. It is rich in pro-vitamin B5 which strengthens and nourishes the hair shaft and root. Its anti-oxidant and protective properties remove excess oil and impurities to reveal a fuller, healthier head of hair. W/S base, aroma, natural preservatives and food grade colors (FD & C) Q.S. When I first received the product, I was litte disappointed to see the ingredients list as the percentages were very low. In 100g product, only 6% are natural ingredients. Of course, the base could contain natural ingredients as well, but they haven’t mentioned the complete ingredients list. Also they have added fragrance and colors. For those who don’t know, The Nature’s Co has 5 ranges of products – Atmospure, Starrize, Foressence, Earthborne and Aquaspark. This hair cleanser belongs to the Earthborne range. 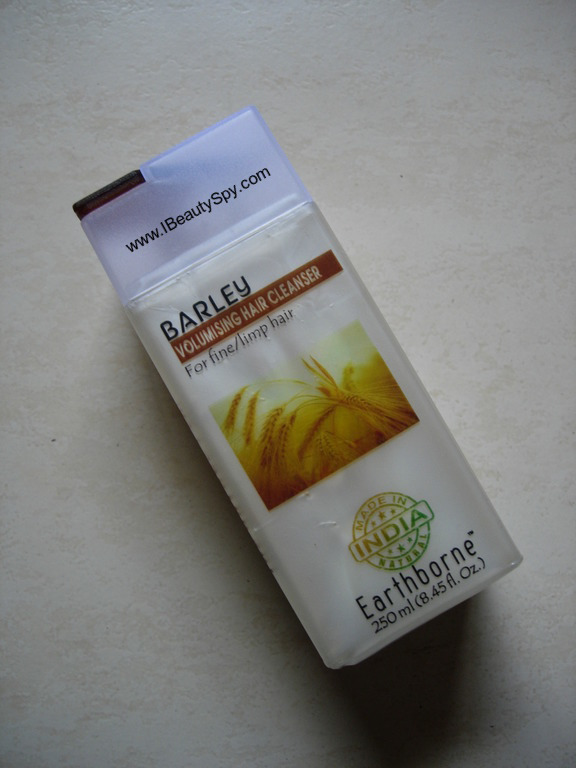 The Nature’s Co Barley Volumising Hair Cleanser is pale white in color with a very light brown tinge. It has a creamy, runny consistency. The fragrance is strong and of some natural ingredient, maybe barley, am not sure. For those dry hair people who use a heavy conditioner, frizziness can be taken care of. But I use only light, silicone-free conditioners which didn’t help much in combating the frizziness. True to its claims, it volumises hair and makes it look fuller and bouncy. But I didn’t notice any strengthening or nourishing as claimed. It removes excess oil and impurities and makes hair fuller, bouncy and healthy. But I haven’t noticed any strengthening or nourishing as claimed. * Cleanses and clarifies scalp and hair effectively. * Makes hair voluminous and bouncy. * Makes hair extremely frizzy. Only for people with oily hair and whose hair is not prone to frizz. No, definitely not. It didn’t suit my dry hair. A bit expensive compared to other SLS free, paraben free hair cleansers available. But The Nature’s Co have 50% off sale many times in a year. Overall, The Nature’s Co Barley Volumising Hair Cleanser has been a nightmare for me. It made my hair so frizzy that I looked like an evil witch shown in cartoons 😅. In an attempt to detangle the frizz, I lost abundant hair. Go for this only if you have very oily hair. But I feel it doesn’t do justice to its expensive price. If you really want to, you can get it during their 50% sale, else its not worth it. 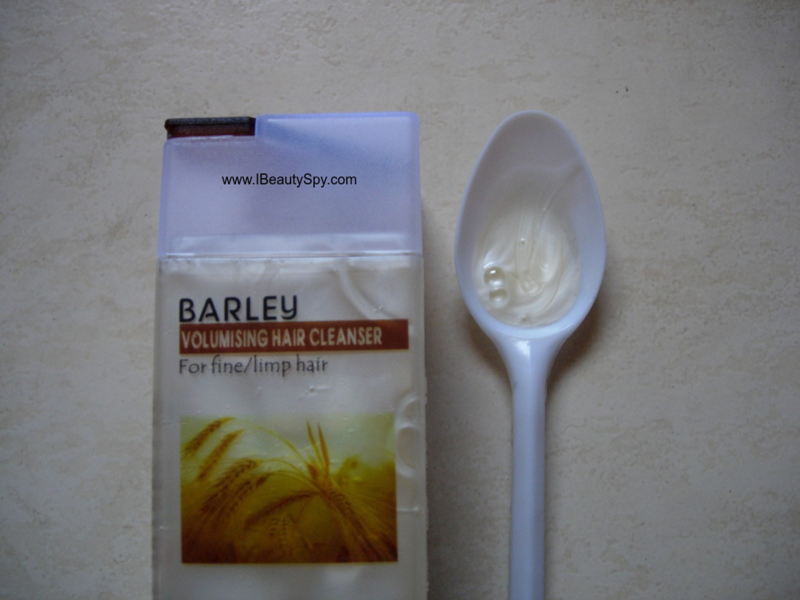 Have you used The Nature’s Co Barley Volumising Hair Cleanser? Do share your experiences in the comments below. Nice and honest review , will not go for it as can cause hairfall . Loved the review. I have used the company’s many product; the ones I like are their after sun gel. Really good helped me a lot in my beach holiday last year and their eye pillow. It is so relaxing. Not a fan of their night cream though. I found it a little too heavy.